No matter how well you perform your job duties, no position is ever really safe. Even the most outstanding administrative professional can lose their job, through no fault of their own, at any given time. Your company could go out of business. Your executive may retire or transfer. A merger could render your job redundant. No one likes to think about the rug being pulled out from under them. But if the unthinkable happens, you need to be ready to immediately start applying for new jobs. Losing your job is stressful enough – you don’t want to compound that stress by having to quickly pull together everything you need to find a new position. That’s why it’s so important to have a current job search toolkit ready at all times. What is a Job Search Toolkit? Whenever I attend speaking engagements, I’m always shocked at the number of people who don’t have a current resume. Some don’t have a resume at all! It’s helpful to think of your resume as a living document. As you learn, grow, and add to your skills set, your resume should reflect those changes. The same goes for major projects and career milestones – you need to add these accomplishments to your resume. You want to highlight the measurable results you have accomplished, not just duties performed for each job on your resume. Other areas you may want to highlight on your resume include leadership positions, professional association memberships, honors and awards, or specific areas of expertise. I recommend reviewing your resume every three months and updating it as necessary. Despite what you may have heard, the cover letter is not dead. It’s still a vital component of your job search toolkit, and a way to introduce yourself and highlight your skills. When creating your cover letter, make sure you have two separate versions – a formal one that can be printed, and an electronic version for companies that utilize online submission portals. While both should contain similar information, your formal cover letter can go a bit more in-depth than the electronic version since online submissions tend to have max word counts. There is no one-size-fits-all approach for a cover letter. It must be specifically tailored for each job. However, the basic template remains the same. First paragraph: Introduce yourself. Briefly explain who you are, what position you’re applying for, and how you found out about the job. Second paragraph: Explain why you’re a good fit for the position. What makes you the best person for the job? It’s helpful if you use verbiage straight from the job listing and find a way to directly tie your skills and experience to the job description. Third paragraph: Suggest an action, such as a phone call or an interview. And don’t forget to thank them for their consideration. Create a basic cover letter template with all your pertinent information, then simply customize it to each position. Your resume is a place to tell a potential employer what you can do. Your professional portfolio, however, is a place to prove it. 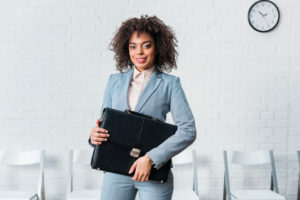 I suggest having two versions of your professional portfolio – a physical version in a three-ring notebook, and an online version that potential employers can access. As with your resume, this should be a living document that’s updated on a consistent basis. We live in an increasingly digital world, and it’s important for administrative professionals to adapt to it. LinkedIn is a phenomenal job search tool, and if you don’t already have a profile, you need to create one as soon as possible. One of the things I love about LinkedIn is that it’s a two-way street. While it’s a great way to find jobs, it’s also a way for great jobs to find you. But to maximize your success on LinkedIn, you need a polished, professional profile. Use a professional photo. While candid photos are fine for your personal social media pages, it’s important to have a professional-looking headshot for LinkedIn. Appearances matter! Include elements from your resume. Your educational background and current and past job experience should be in your profile. This allows potential employers to quickly determine if you’re someone they should consider. If this information isn’t included, they’ll likely pass. Strut your stuff. LinkedIn encourages you to list your awards, honors, and skills. Don’t be shy! There’s nothing wrong with showcasing your accomplishments. Put your personality on display. LinkedIn is a professional site, but that doesn’t mean you need to pretend to be a corporate robot. Most employers are looking for a real person. Feel free to add some personal interests. Ask for endorsements. Once your LinkedIn profile is up, ask your connections for endorsements or recommendations. The more people who legitimately and honestly vouch for you and your skills, the better. Remember, adding more information to your profile will give you a better chance of being seen by the right people! You never know when an opportunity will arise. Personal business cards allow you to be ready for a quick exchange of information at any time. Having your own business card, separate from those potentially offered by your company, is a must-have for your job search toolkit. These cards should include your name, phone number, email, and links to your professional social media pages and online portfolio. You may also want to add your professional branding statement, areas of expertise, or other important details. Your business cards don’t need to be fancy or expensive – there are plenty of online templates that allow you to create and print them at home. A job search toolkit is the best safety net you can have when it comes to an unexpected job loss. It allows you to make your next move much quicker, so you can jump into the job search with very little downtime. It’s also helpful when a promotion or new position becomes available, so you can be one of the first submissions and stand out from the crowd! 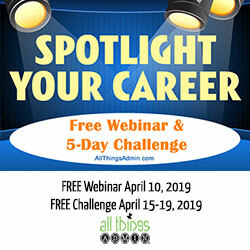 Are you ready to create or update your job search toolkit? These free resources will help you get started! 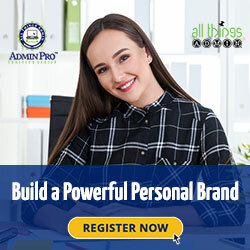 Click here to download our resume, cover letter, and business card templates, get help creating your professional portfolio, and more. And don’t forget to take our Career Preparedness Quiz for additional insight on where you stand and what you can do to better your position. 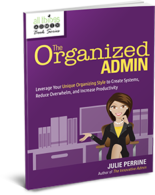 For even more tips and resources, I highly encourage you to check out my book, The Organized Admin™. 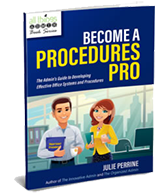 In it, you’ll learn how to develop simple organizing systems that promote success in every aspect of your career!